On a sunny Wednesday afternoon at the Viceroy Hotel in Santa Monica, California, Ubisoft invited PlayStation LifeStyle and other select publications to spend an hour in a world-first preview of their upcoming open-world shooter, Far Cry 5. 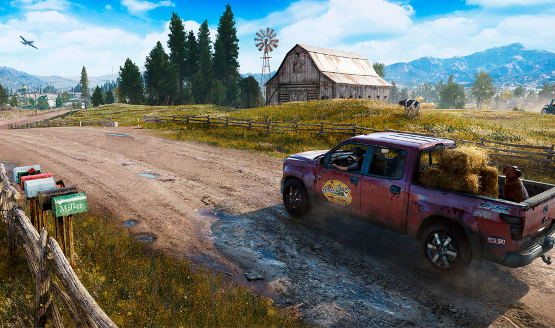 Rumors had been swirling for a while that the game was set in Montana, and Ubisoft could finally confirm that this was true. 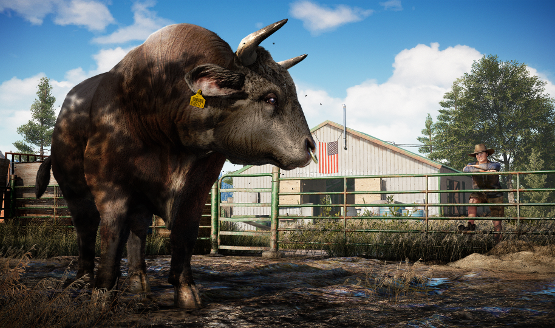 We were able to sit down with Dan Hay, Executive Producer and Creative Director on Far Cry 5, to glean just a little bit more information following a riveting presentation. Our interview has been transcribed for your reading pleasure below. PlayStation LifeStyle: Give us an overview in your own words of what we just saw. Dan Hay, Executive Producer/Creative Director: I think in terms of what you just saw…that’s a great question, no one’s asked me that! We gave you a taste of the game, right? We gave you a sense of our process of building a world, and making it beautiful and believable, and our process of putting it under pressure. Making that believable, feel like it’s now, it’s present. It’s a story that you can understand, that you could in some ways relate to. And then, we introduced you to some of our characters, we introduced you to some of the personalities involved, and even the structure of that. Then what we did was we showed you the toys and gave you the premise of what you’ll be able to see and play pretty soon. PSLS: You mentioned making the world beautiful and believable. We obviously saw that it’s very beautiful, but what would you say you did to make it believable? 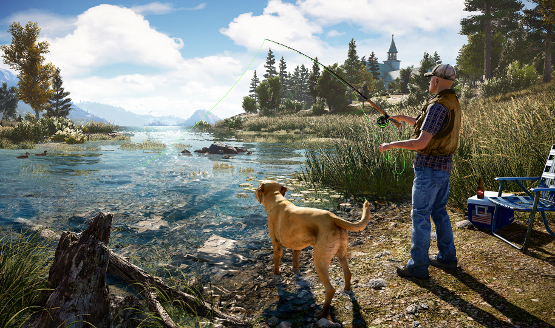 What challenges did you find there, especially in a setting like Montana? Dan: I think that, one of the things that’s funny about building a world is that there’s a lot of things that we know about worlds. All of us. Earth, how things work, in real life, that we take for granted. We know how big a door should be. We know how tall a stair should be. We understand how people look at you, or maybe when you enter into a room, that they don’t always…they’re not just AI, standing and waiting to give you a mission. They have a life! They have personality. They have a job. They have an agenda. And so we just tried to put in the little nuances like that in the world to make it feel real. Then we wanted to put a conceivable pressure in the world that you could imagine that somebody might have to deal with today, just to be able to make it so that it was relevant. PSLS: You said AI have their own lives. So does that mean certain people will only be available certain days of the week or certain times of the day? Dan: I think we just gave you a taste of the game, and we gave you a ton of information, so I totally get where you’re gonna ask questions about how does it work, is there a lifecycle.. the truth is that we’re gonna save some of those beats for later. But what we really did want, is that we wanted people that felt real. That had an agenda. That’s about as far as I can go on that without giving away too much! PSLS: In the presentation, we saw some concept artwork showing a man staring off over a cliff, at the edge of the abyss as it were. Where did you find that inspiration? Dan: That’s a good question. I got a couple questions about that – kind of “chicken or the egg,” right? The feeling that I have right now, sort of looking at the global consciousness, people feeling a little bit uneasy about different things that are going on, is, when we started to make this game, and we started to make it, was it more that that feeling was kind of pushing us? Or was it that we had that feeling [first], that we made the game as a reflection? I don’t know the answer to that question. What I would simply say is that the idea of trying to build a real world, and having it feel like it’s receiving a real pressure, and that it’s something that you can relate to or understand, means that it has to feel convincing. And so we take from things that we see and that you know and you experience in the real world. It has to be believable that our characters would watch the news. Or would hear stuff on the radio. Or still have that same, some of them have the same pang of nervousness that we might have. PSLS: Are you guys looking into multiplayer options for this? Dan: Can’t talk about that yet! PSLS: You mentioned [in the presentation] compound sizes. Would you say the world here is bigger than before, or comparable to previous entries? Dan: We’re not specifically talking about the size of the world right now, but when I talk about the compound, what I’m specifically talking about is like the Father’s compound in the world. In terms of the scope of the world, what we really tried to focus on was…I can’t answer specifically how big the world is, yet. What I can tell you is, we not only focused on making sure that it was generous, and big; we also focused on the idea that you could traverse it the way you wanted to traverse it. So rather than locking you into a specific, linear story, we wanted to be able to make it so that you could go out into the world, and you could meet people, and you could go the direction you wanted to go, meet people in the order that you wanted to meet them, and kind of egress the world the way you wanted to be able to do it. So that your story, and your experience moment-to-moment might not be the same as mine. PSLS: Speaking of the player character, can you give a little bit more info on that? Dan: I think without going too far into it, our intention is to try and make it so that the people who play the game are playing as themselves, if they want to. That’s as far as I can go! PSLS: At least in terms of story, is it all fleshed out? You know exactly where you’re going with this? Dan: We spent a lot of time on the story. Trust me, I’m dying to talk about it! But what we built was, we built a really compelling family, with real compelling family members, who have agendas. When you meet them out in the world, you’re gonna feel the weight of…they have a job to do. They have a mandate from the Father. And when you get in the way of them doing that job…worlds collide! PSLS: Is there any push towards a morality system? If you kill someone, are they gone forever? Are there weighty decisions? PSLS: Can you describe the different vehicle options? Dan: I can’t go into every vehicle, or all the different stuff, but the point is that if you were in Montana, and you had carte blanche to basically run around and do what you wanted to do, you’d want to be able to get into a muscle car. You’d want to be able to drive an 18-wheeler. You’d want to be able to get into a fitted crop duster with a machine gun on the front of it. 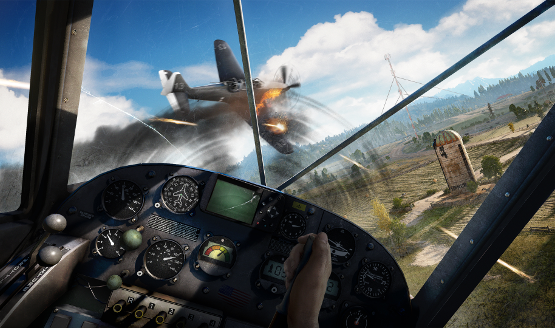 You’d want to be able to do strafing runs, and bomb. We want to be able to let you do that! We also want to be able to make it so that some of your guns-for-hire have stuff like that. You can call them, and they can come in, and they can bomb for you. So that we are always adding to the anecdote factory, and you are kind of bringing it with you, like a wake, as you go through the world. PSLS: What kind of weapons will we find in Montana? Dan: I think we’re saving specific beats on weapons for E3. Trying to think if there’s anything specific that I can tell you about that…I just think that you know, that we’re pretty crazy about that, and we want to make sure that the player has some cool stuff to play with. So, yeah, ask me at E3! PSLS: How about the underlying tech? What engine is it using? Dan: It’s the same tech that we’ve been using to build Far Cry 3, Far Cry 4, and Far Cry Primal. It’s the Dunia Engine, and it’s growing and every single time that we make a game, we leverage that tech, because we know it well. It really does build beautiful, rich worlds. PSLS: Will Far Cry 5 be enhanced on the Project Scorpio or PS4 Pro? Dan: [zips his mouth shut]…we’ll talk about that [later]. Truly, our intention today was to show you the game, and get you excited for it. The specifics on all of those types of stuff, we’ll talk about at E3. PSLS: What’s one thing that you hope that fans take away when they are first shown this game? Dan: Great question. I think, sometimes when people first hear Montana, they’re like “Montana?” And then after they get a sense of the game, and they hear the pitch, and they hear the creative end, what we’re doing, then they’re like “Ah! Montana! I get it.” I think we took a lot of time, and a lot of energy and passion to be able to do something different, and to be able to do something unexpected. To be able to give people an experience that is based on some of the things that we’ve done before, but is giving them an experience that feels new, it feels inviting, it feels different. I think they’re really going to appreciate it. I just like that this brand can do that! I like that Far Cry can take you to the unexpected. It can take reality and it can twist it a little. It’s cool, and I want fans to enjoy that. PSLS: So you’d say this is very well-realized then, from what your initial concept was? Dan: I think, yeah! I think when we think about the game, and think about what we wanted to do with it, where we wanted to take it, I think, especially when you meet the characters, and you meet the Father, and you meet the brothers, and the sister, and you have that face time with them, it’s what we’d hoped. PlayStation LifeStyle would like to thank Dan Hay and Ubisoft for taking the time to show us Far Cry 5 and talking to us. Far Cry 5 will be released on February 27, 2018 for the PS4, Xbox One and PC.